Christmas Tree Farms Near Washington, D.C.
Getting ready for the Christmas holiday? A great way to start the season is to take the whole family out to a Christmas tree farm. You will find lots of great farms where you can cut your own Christmas tree in the Washington, D.C. suburbs of Maryland and Virginia. Many of the Christmas tree farms also sell wreaths, greens, ornaments, and other holiday items. Some farms sell out quickly, so it is best to go early and call to check on availability. With 60 acres off Detrick Road in Mt. Airy, Maryland, Gaver Tree Farm is one of the better cut-your-own options in the area. It's open daily from 9 a.m. to 5 p.m. and offers Douglas Fir, Canaan Fir, Blue Spruce, Fraser Fir, and Scotch Pine varieties. Between November 23 and December 23, 2018, the wreath shop, farm market, and bakery (specializing in warm cinnamon-sugar apple cider donuts) will be open in addition to the cut-your-own and fresh-cut Christmas tree selection. The Christmas Cafe will be open on weekends and professional photography sessions are available by appointment. New to the 2018 holiday season, Gaver Tree Farm has an extra field on the back side of the farm with more Douglas Fir trees. Services such as shaking and baling, saws, and tree drilling are all free. Linden Hill Farm in Upper Marlboro, Maryland sells Douglas Fir, Norway Spruce, White Pine, Concolor Fir, and Canaan Fir. There are also 170 fresh-cut Fraser and Douglas Fir trees ranging from five to 11 feet tall. The 2018 winter season starts on November 23 and is open until trees sell out. However, in past years the trees have been sold out within the first two or three weeks, so it's best to get here early. Linden Hill is open Friday through Sunday between 8:30 a.m. and 4:30 p.m. Don't miss the Snack Shack featuring Nathan's hot dogs, warm spiced cider, and hot chocolate. Naughty Pine in Dickerson, Maryland offers a large selection of Douglas Fir, Blue Spruce, and Norwegian Spruce trees. Open every weekend in December from 10 a.m. to 5 p.m. Eight-foot trees cost $50; 8-10 feet is $75, and 10-12 feet is $100. Cash and checks are fine, but credit cards aren't accepted. At Triadelphia Lake View Farm (TLV) in Glenelg, Maryland, you'll find fresh cut Fraser Fir trees from the mountains of North Carolina. They also offer Douglas Fir, White Pine, Blue Spruce, and White Spruce. Kids will love the Santa Workshop, where they can sit with Santa for a photo on Saturdays and Sundays from 10 a.m. to 4 p.m. TLV is open Monday through Thursday from noon to 5 p.m. and Friday through Sunday from 9 a.m. to 5 p.m. In Leesburg, Virginia, this family-run Christmas tree farm has been in business since 1999. Every season it plants about 1,000 trees, including White Pine, Scotch Pine, and Norway Spruce as well as fresh-cut Fraser Firs from the Smokey Mountains. They are open from November 25 to December 23, 2018, between 9 a.m. and 5 p.m. on weekends. Also available are wreaths, bows, garland, tree stands, tree bags, tree food, brown free-range chicken eggs, and honey. Free hot cider, coloring books, and use of picnic tables are extra perks. Day Star Farm has been breeding Connemara ponies for more than 30 years, and come winter they also provide choose and cut-your-own Christmas trees. Located off Route 861 in Leesburg, Virginia, it features Christmas music, outdoor fire pits, plus free hot chocolate and candy canes. You can choose from Scotch Pine, Norway Spruce, and Concolor Fur. Day Star is open Saturday, December 1 and 8 between 9 a.m. and 5 p.m. or Sunday, December 2 and 9 between noon and 5 p.m.
Hank's Christmas Trees at Hartland Farm and Orchard in Markham, Virginia stocks Fraser Fir, Douglas Fir, Concolor Fir, and Blue Spruce. Check out the holiday decorations too, such as handmade wreaths. Caramel apples and hot cider are for sale as well as free hot chocolate on weekends. Down Sweetwater Lane in Chantilly, Virginia, Joe's Trees is a great family-friendly option. It has a fine selection of Fraser, Canaan, Concolor, and Korean Firs as well as White Pine, Blue and Norway Spruce. For the kids, there are snacks and hayrides (on November 23-25 and December 1-2 and December 8-9, 2018). From November 16 through December 16, the Christmas tree farm is open on weekends and the Christmas shop is available daily; it sells fresh wreaths, swags, custom evergreen arrangements, jellies, canned goods, hand-craft artisan items, and local lamb, beef, and bison meat. Krop's Crops is part farmer's market and part Christmas tree supplier in Great Falls, Virginia. There are pre-cut trees like Noble Firs from Oregon, Fraser Firs from North Carolina, and Douglas Firs from Pennsylvania, or you can cut your own on weekends after November 23 from 11 a.m. to dark. They also sell poinsettias, wreaths, ornaments, lights, tree stands, firewood, and more. Children will want to see Santa Claus, who visits from 1-4 p.m. on December weekends leading up to Christmas Eve. Just outside Washington, D.C., and Arlington, Middleburg Christmas Tree Farm is one of the more popular options. Come cut your own tree, have a picnic lunch and enjoy the scenery. 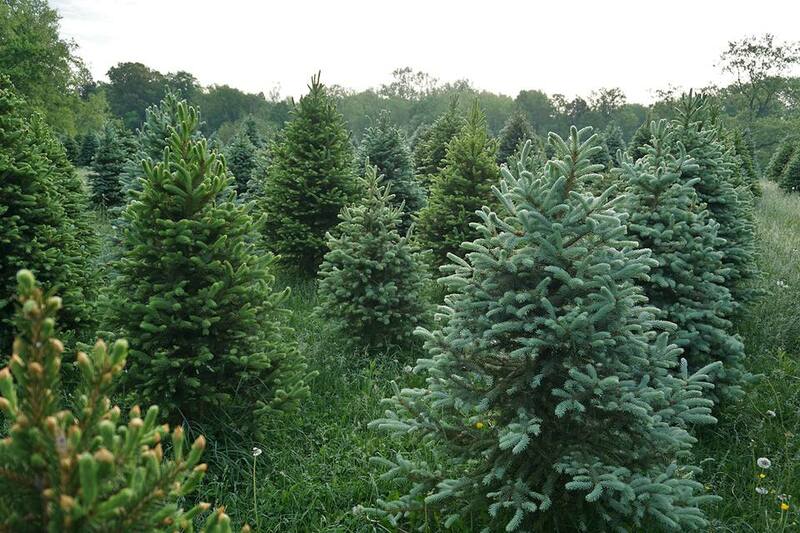 Choose from Norway Spruce, Colorado Blue Spruce, Douglas Fir, and Concolor Fir. You can visit on weekends between Thanksgiving and December 17 from 9 a.m. to 5 p.m. Fridays have limited hours (1-5 p.m.). ﻿Snickers Gap in Round Hill, Virginia is easily one of the most beautiful landscapes. The family-own farm has run for nearly four decades on the eastern slope of the Blue Ridge Mountains, overlooking the Loudoun Valley. Its fir and spruce trees are lush and full as are the wreaths. Free hot apple cider is available too. They are open after Thanksgiving on Monday through Friday from noon until dark and weekends from 9 a.m. to evening. Christmas Model Train Displays Near Washington, D.C. Attend Dozens of Christmas Tree Lighting Ceremonies Near Washington, D.C.
Where to See the Best Christmas Lights Near Washington, D.C.
Have a Family-Friendly New Year's Eve Near Washington, D.C.
Top Holiday Getaways Near the Washington, D.C.